미국 TRUEAV CL2 HDMI 케이블은 동선기반의 최장 25M 케이블로써, CL2 HDMI 케이블은 480i, 480p, 720p, 1080i, 1080p에 해상도를 지원합니다. 또한 차세대 HDMI버젼인 HDMI 1.3버젼에 완벽한 호환성을 제공합니다. CL2 HDMI 케이블은 소스 기기들과의 좋은 설치 호환성을 자랑합니다. CL2 HDMI 케이블은 DVI 커넥터보다 좀 더 사용자에게 친숙하고 작은 커넥터를 채용하였습니다. 또한 비압축성(프로그래시브) 영상과 다중채널 음성(5.1채널 돌비음향) 두 가지를 하나에 케이블로 해결하는 고대역 제어 스펙을 제공합니다. Copper based cables with max lengths of 25m. The HDMI CL2 cables support the following resolutions: 480i, 480p, 720p, 1080i, 1080p. These cables are rated for in-wall installations. 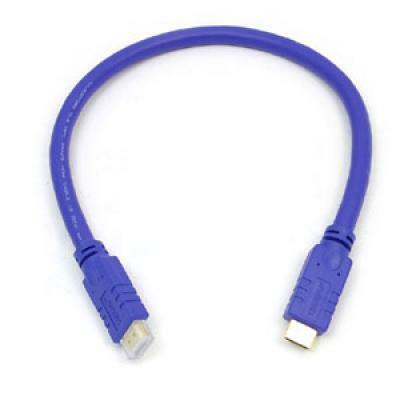 HDMI is a much smaller and user-friendly connector than the DVI connector. The specification handles high-bandwidth, uncompressed video and multi-channel digital audio as well, all in one cable. Type A connector (19 positions) carries a single TMDS link and is permitted to carry signals up to 165Mpixels/sec. Greater cable capacity for support of 12-bit color, also called Deep Color™, available from advanced HD sources and displays. Greater color depth, from 8-bit to 12-bit, allows more detailed gradations of individual colors for the display of billions of colors. Ideal for advanced HDTVs with xvYCC color, also called x.v.Color. x.v.Color widens the number of available colors for 1.8 times more colors than standard RGB. Greater cable bandwidth for support of Dolby TrueHD and DTS-HD lossless surround sound, available on Blu-ray Disc™ and HD DVD™ movies. Support for the HDMI Consumer Electronics Control channel, enabling automated audio/video component setup and control. Ideal for HD components with 120 Hz refresh rates, providing smoother, more fluid video reproduction. HDMI is a data superhighway for digital video and audio. For the best high definition experience, use an HDMI cable that delivers all the picture and sound data your HD components require. 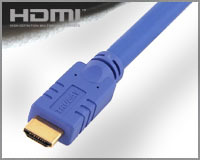 Get all your HDMI questions answered at TrueAV.com/HDMI.